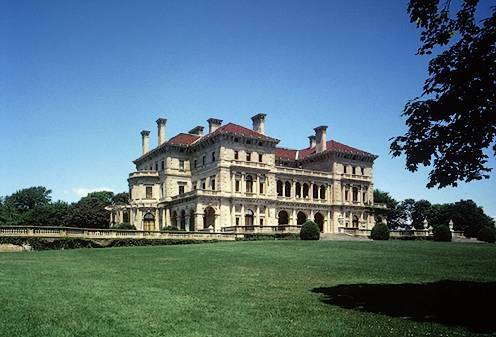 The Breakers is the grandest and probably the most opulent and palatial of Newport's summer "cottages" and a symbol of the Vanderbilt family's social and financial preeminence in turn-of-the-century America. The Vanderbilt great wealth and fortune was established in steamships and railroads by commodore Cornelius Vanderbilt (1794 - 1877). During the course of the 19th century, Cornelius Vanderbilt developed an extensive line of steamships that commanded the coastal trade and the transport of passengers to California via Nicaragua for the Gold Rush of 1849. In the years following the Civil War, he consolidated several railroads into the New York Central, and created the first "trunk" line connecting New York and Chicago. The line allowed for a single train to travel between the two cities without changing cars. The development of this railroad system was pivotal in the industrial growth of the nation during the late 19th century. 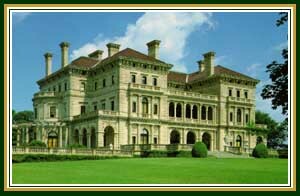 The Commodore's grandson, Cornelius Vanderbilt, became Chairman and President of the New York Central Railroad system in 1885, and purchased a wooden house called The Breakers in Newport during that same year. In 1893 or 1895, Cornelius Vanderbilt II commissioned the architect Richard Morris Hunt to design a villa to replace the earlier wood-framed house destroyed by fire in November of 1892. 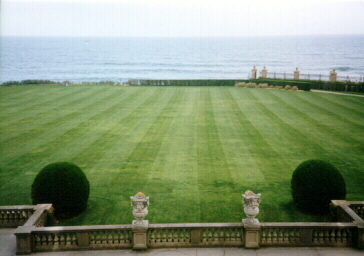 The "new" Breakers was the product of the collaboration between these two leading figures in American industry and art, and incorporated many of the elements of the Beaux Arts tradition, including symmetry and dignity, and overlooked Rhode Island Sound in Newport. Hunt was the first American to study architecture at the prestigious Ecole des Beaux Arts in Paris, and he created an Italian Renaissance style palazzo -- a product modeled after the European High Renaissance 16th century palaces of Genoa and inspired by French and Italian designs of that period -- with 70 rooms decorated by an international team of artists and craftsmen, including the Parisian decorators Jules Allard and Sons, the Austrian sculptor Karl Bitter, and the Bostonian designer Ogden Codman. Allard and Sons of Paris assisted Hunt with furnishings and fixtures, the Austro-American sculptor Karl Bitter designed relief sculpture, and the Boston architect Ogden Codman decorated the family quarters. The interiors incorporate an extensive use of rare and imported French and Italian stone, marbles, alabaster, mosaics, frescoes, gilt bronze, sculpture and elaborate guilded plasterwork, as well as the mansion's wooden trim and ceiling paintings. 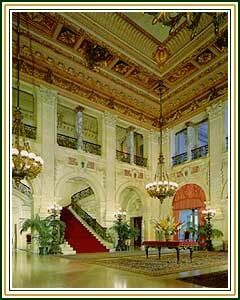 In 1995, The Breakers was designated as a National Historic Landmark, with the first floor and a portion of the second being opened to the public. The extensive grounds overlooking the ocean also were open to the public, and even included a "children's cottage" complete with fireplace, kitchen, and bedroom. 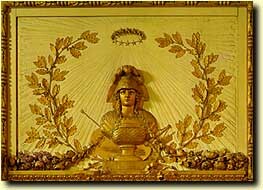 Detail of an overdoor panel depicting Minerva, by Gilles-Paul Cauvet c.1778, in the ladies reception room. It is particularly noteworthy that this 18th-century room was a gift from Marie Antoinette to her goddaughter.